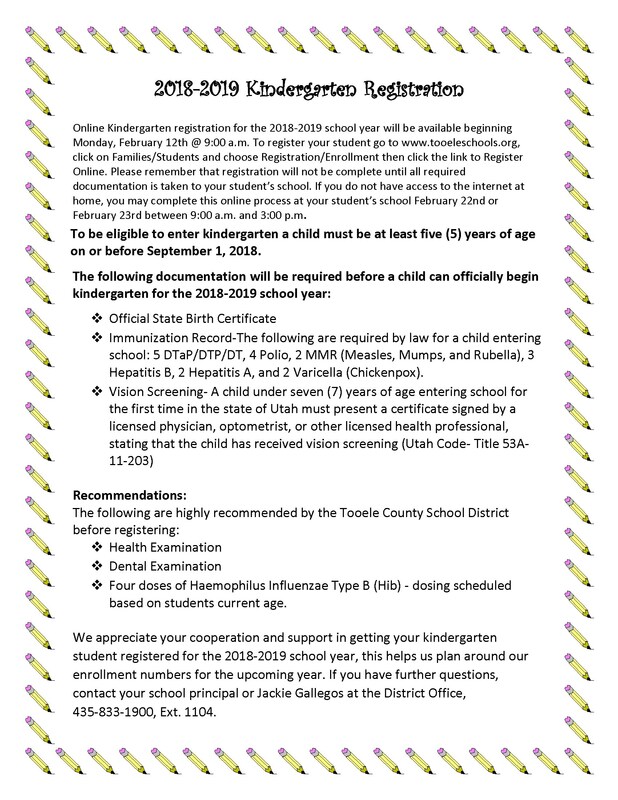 Official State Birth Certificate - If the official state birth certificate is not available, a copy of a state birth certificate for a child born within Utah can be obtained from the Tooele County Health Department, 151 North Main, Tooele. A copy may also be obtained from the Utah State Division of Health, 554 South 300 East, Salt Lake City. Birth certificates for a child born outside of Utah should be obtained from the State Division of Health in the state the child was born. 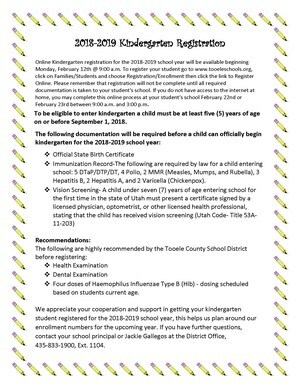 Immunization Record - The following are required by Utah law for a child entering school: 5 DTaP/DTP/DT, 4 Polio (IPV), 2 MMR (Measles, Mumps, and Rubella), 3 Hepatitis B, 2 Hepatitis A and 2 Varicella (Chickenpox). Vision Screening – A child under seven years of age entering school for the first time in the state of Utah must present a certificate signed by a licensed physician, optometrist, or other licensed health professional, stating that the child has received vision screening (Utah Code-Title 53A-11-203). Four doses of Haemophilus Influenza Type B (Hib) – dosing scheduled based on student’s current age. Each child entering kindergarten must have a pre-screening assessment. This assessment will be scheduled by the school prior to the end of this school year. It is important that you have your child registered to receive an assessment time. A kindergarten orientation will be held at local schools in August where general kindergarten information will be shared. We appreciate your cooperation and support in getting your kindergarten student registered for the 2018-2019 school year; this helps us plan around our enrollment numbers for the upcoming year. If you have further questions, contact your school principal or Jackie Gallegos at the District Office, (435) 833-1900, Ext. 1104.